Make your living room a space you will be proud to bring friends and family into for get togethers. Design it so that it matches your personality, from the floor to the ceiling. 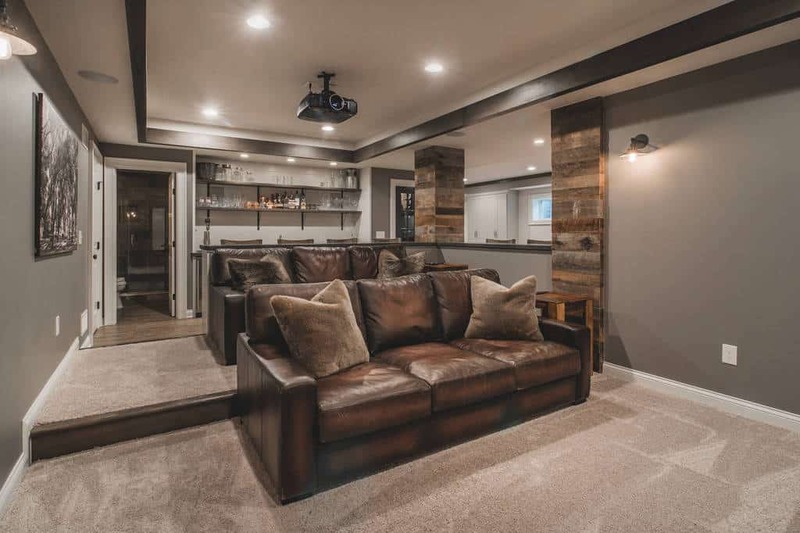 Whether you are building a new place from scratch, or simply remodeling an existing living room, you will have plenty of options. 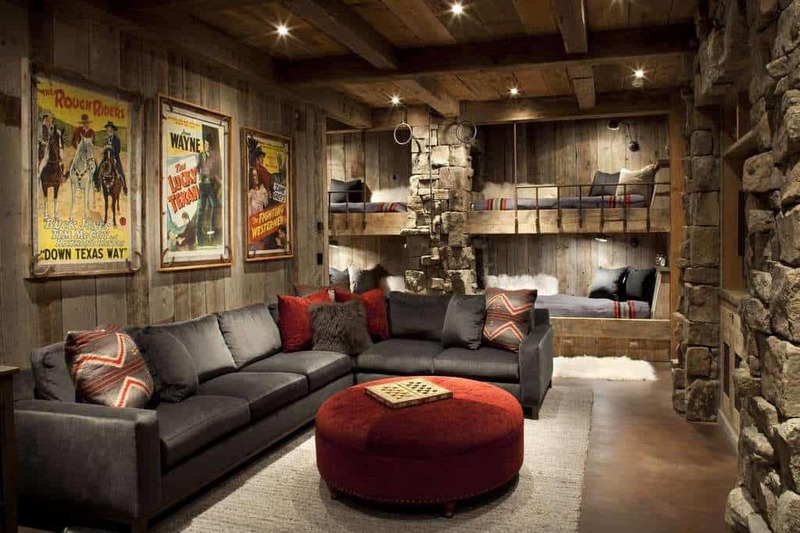 Narrowing them down can seem tough, but one thing is certain – a rustic style looks great. 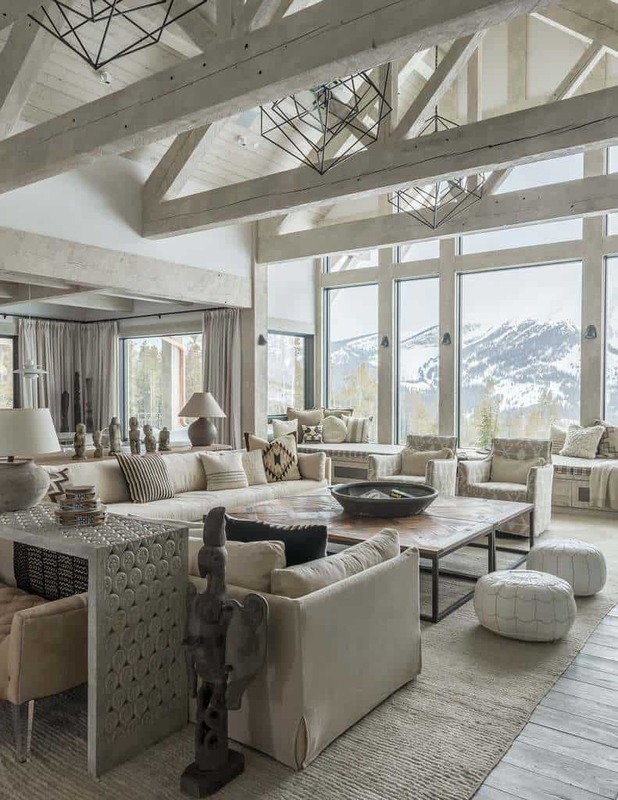 Below, we have gathered 54 rustic living room designs and ideas for you to browse through. You will see some classic examples as well as some contemporary blends. 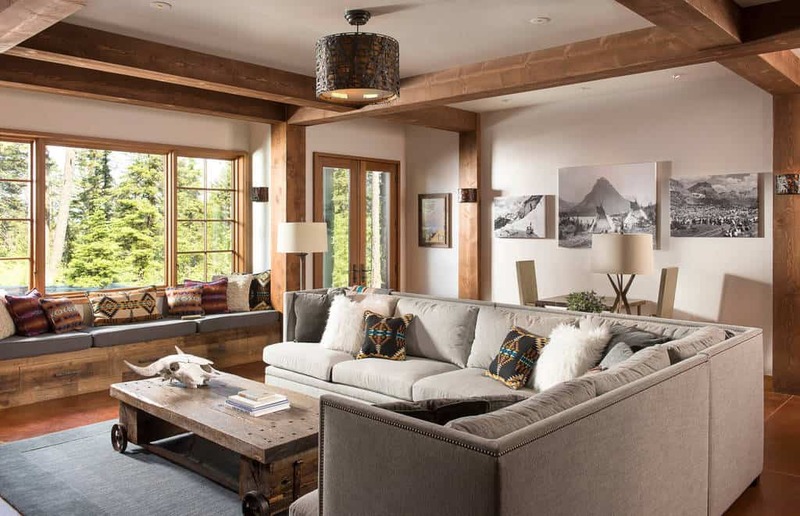 Take your time and see if a rustic style will work for your next living room. This living room gives you great options. Whether you want to relax on the sofas or take in some games of pool, you have choices. With an open and spacious floor plan, you can host all your get togethers here. 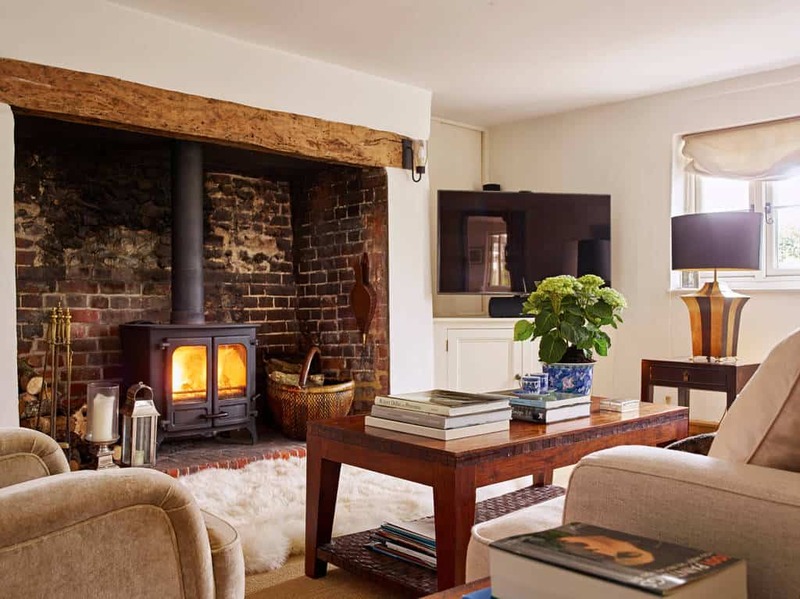 With a wonderful fireplace area, filled with years of character, this living room builds a light and comfortable environment. With classic furniture and decor, you will love being here at the end of a long day. 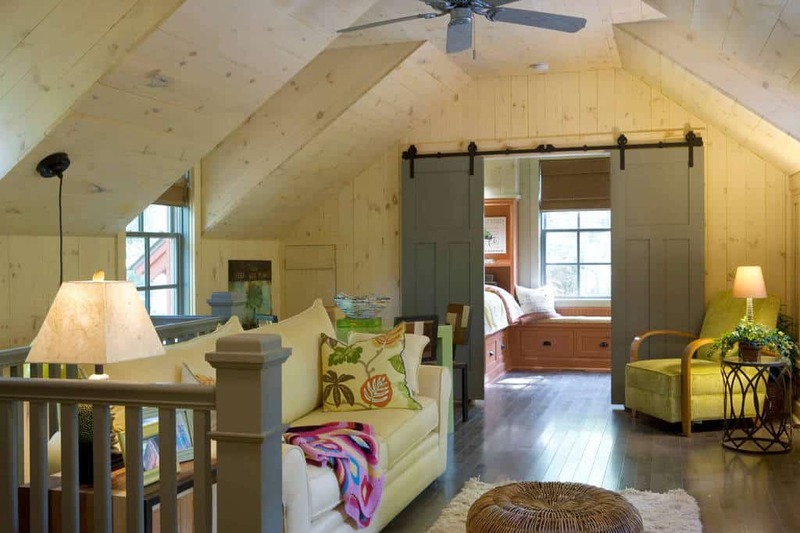 This perfect relaxation space will let you unwind with a good book at the end of the day. Sit back and soak in the natural light pouring in the windows. Photo by RICHARD KISSANE Building Contractor LTD. This space is functional and fun. 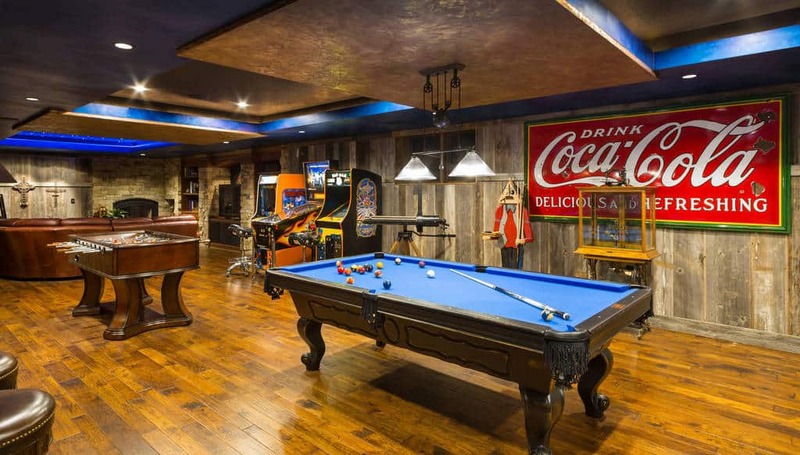 With a weathered wooden style throughout, this room gives you the option to store things above and play some games below. Sit at the bar and enjoy a drink. With an open floor plan connecting the living room, kitchen, and dining area, this whole space has a warm and vibrant feel. 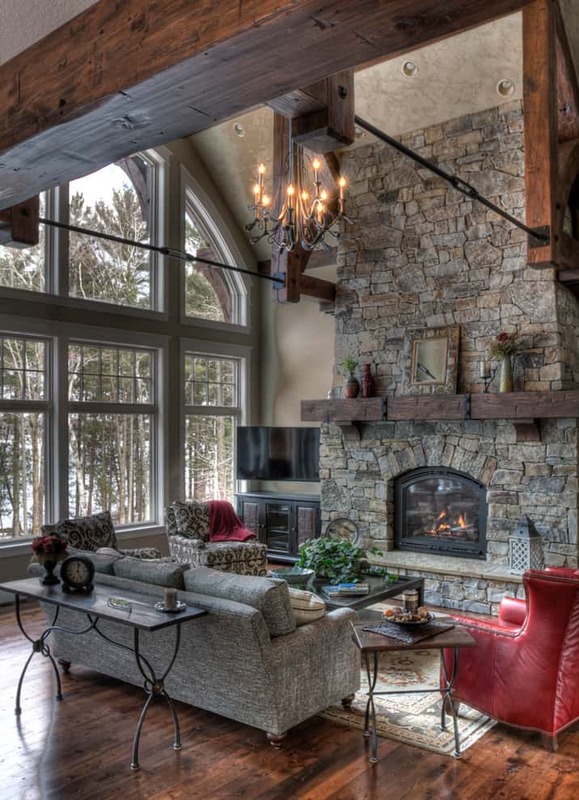 The hardwood styles, combined with the stone fireplace, make a beautiful rustic area. With gray cabinets and shelves providing contrast to the hardwood, this living room is comfortably bathed in natural light. Kept warm and relaxed, sit here after a long work day. 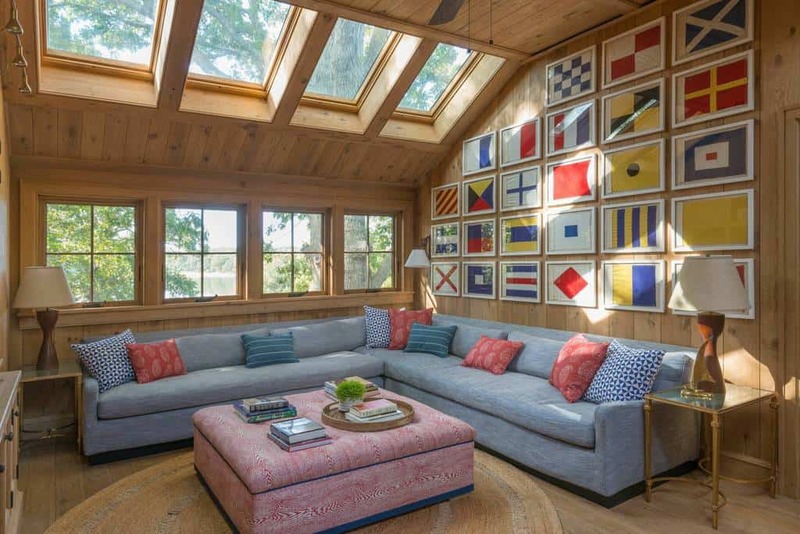 The high ceiling of this living room allows for the windows to rise up and let the light shine in. 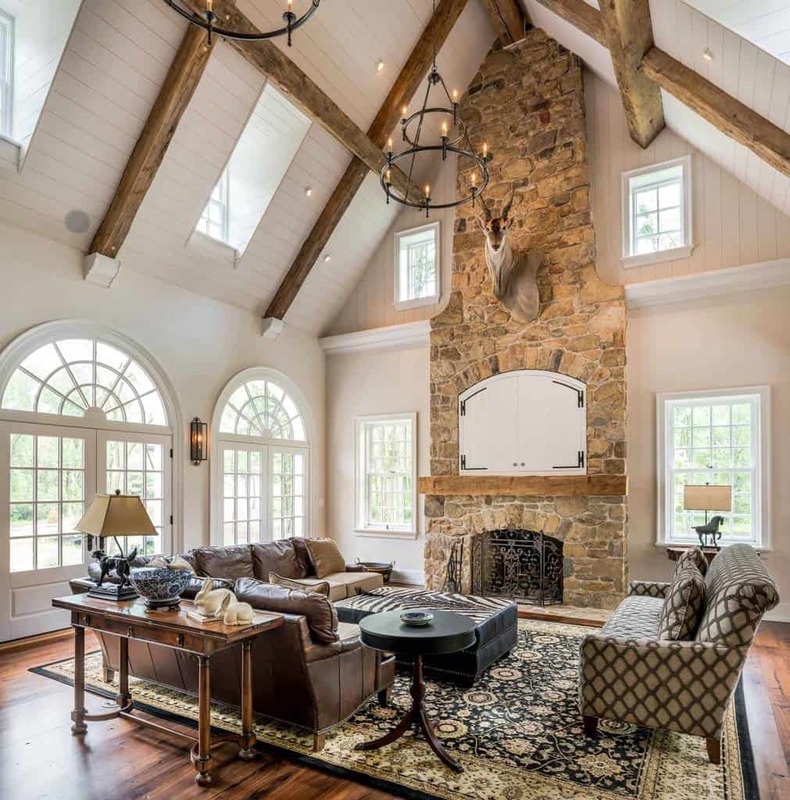 With a light stacked stone design to go with the hardwood all around, this room has wonderful decor and furniture to match. 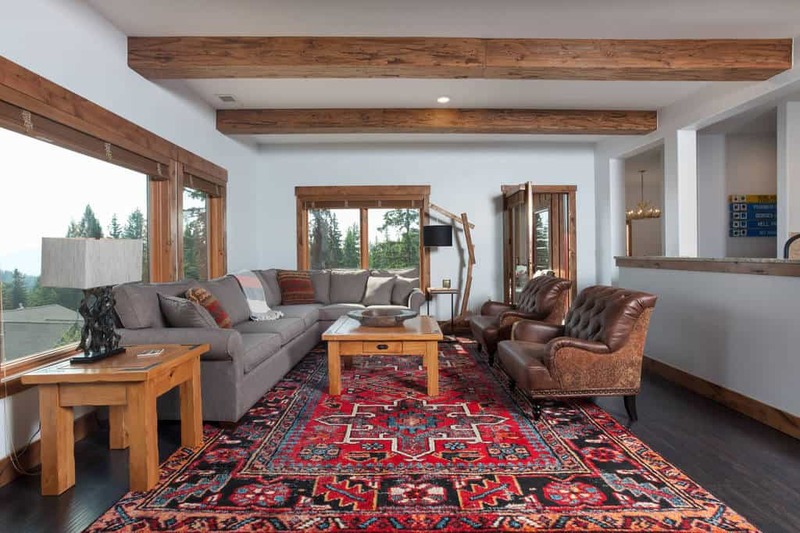 The hardwood floor and beams around this room give the perfect backdrop for this Southwestern decor. From the artwork to the patterned pillows, this space is a style win. Taking a step back in time, but with the comfort of modern furniture, this living room has a medieval style, complete with the overhead light fixture adorned with candles. This room makes use of a wonderful gray color scheme to bring it elegance. 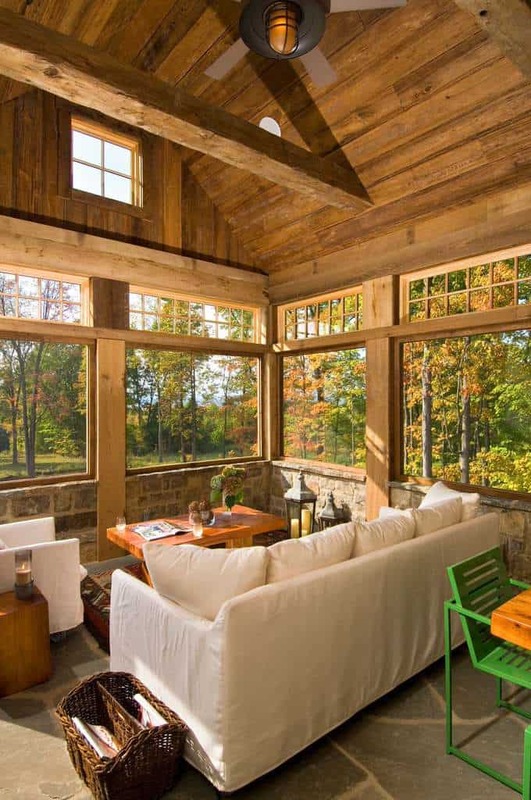 With large windows to provide a wonderful view, you will love the naturally lit space. This wonderful space is cozy and will make you feel at home. 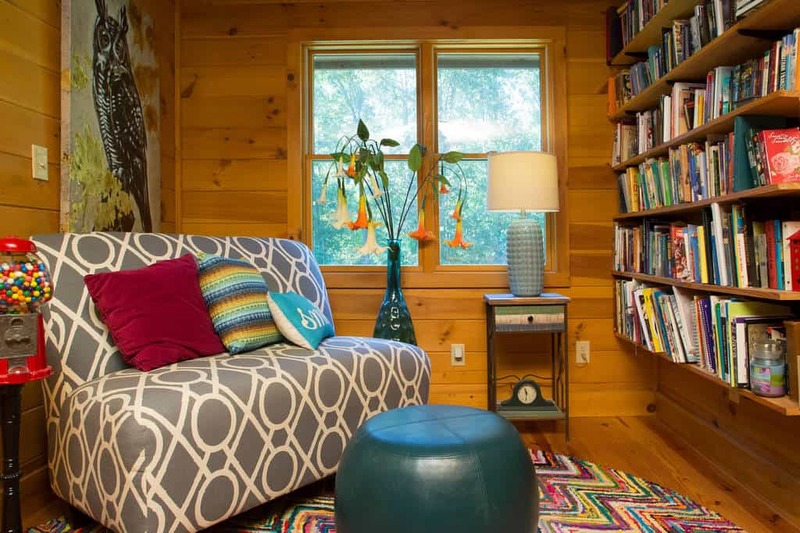 With fun decor and plenty of shelf space for your favorite books, you can kick back and relax here anytime. With modern curves, white against a wooden backdrop, this living room is stylish. The beautiful carpet that covers the hardwood floor sets the tone for this room that has plenty of natural light shining in. This living room table really centers the room with its wonderful stone style. 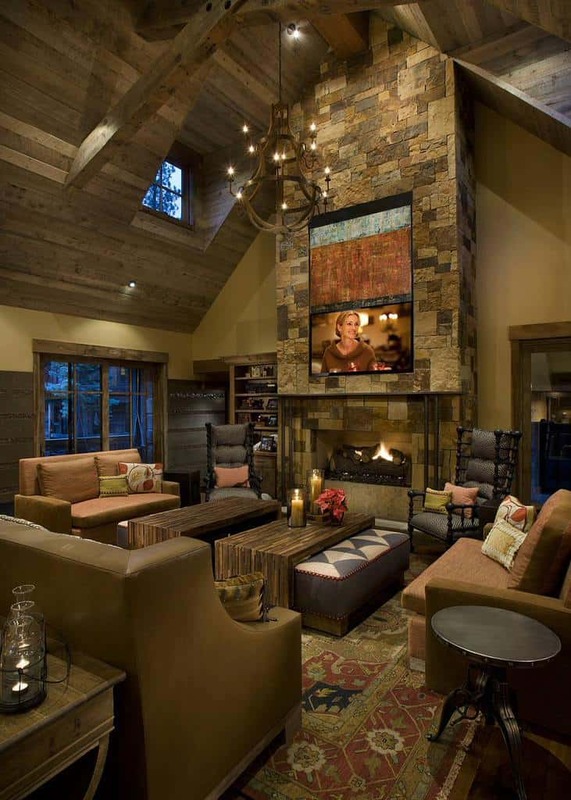 With a stacked stone look for the fireplace, you can keep warm and catch up on your favorite television shows here. The beautiful hardwood cabinets and shelves on either side of the stacked stone fireplace accent the elegance of this living room. The couch curves around, giving you the option of having guests over. 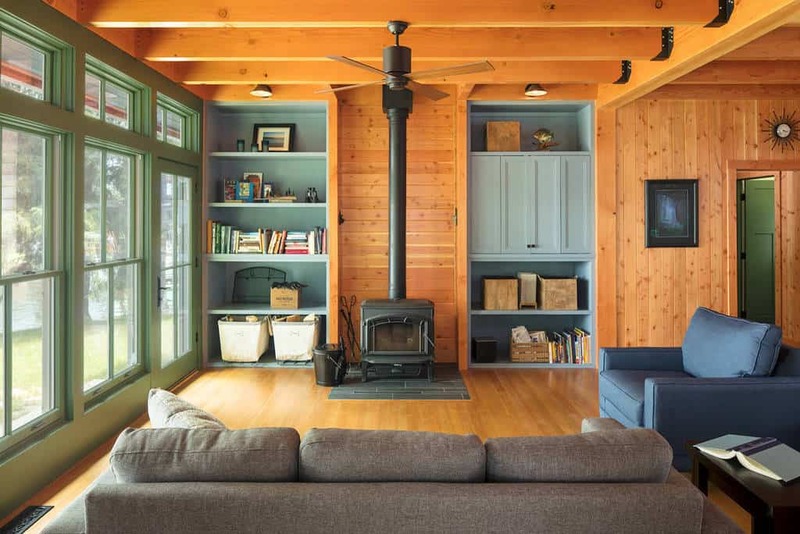 This living room is a picture of a calm, modern cabin in the woods. 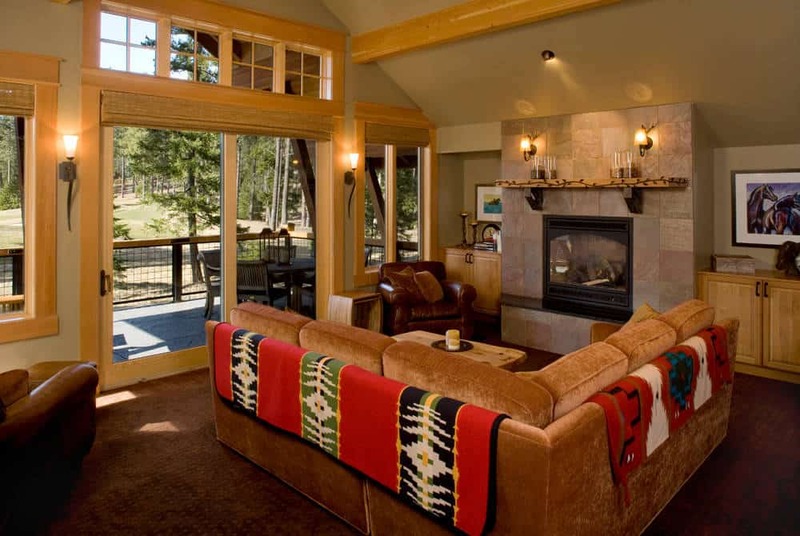 With a warm fireplace and beautiful decor and furniture, you will feel welcome here. 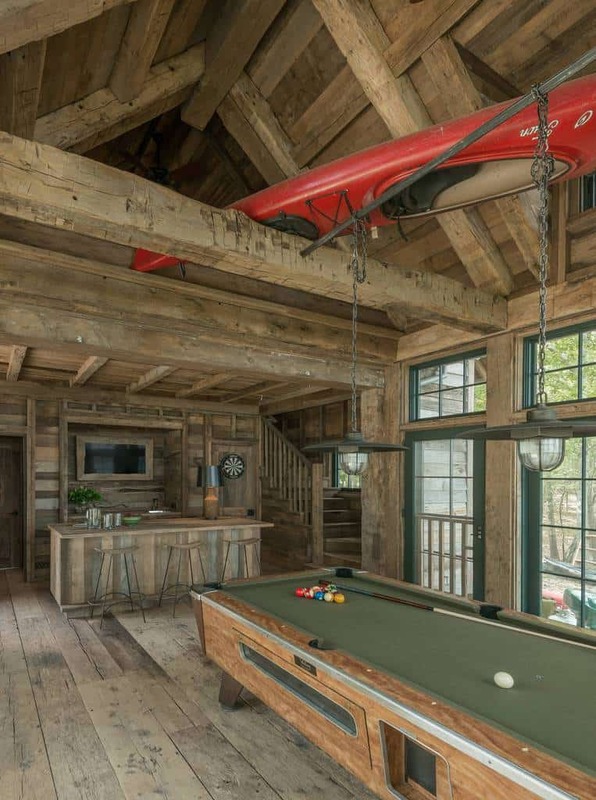 Photo by Big Wood Timber Frames, Inc. The high ceiling allows for these large windows to take center stage. 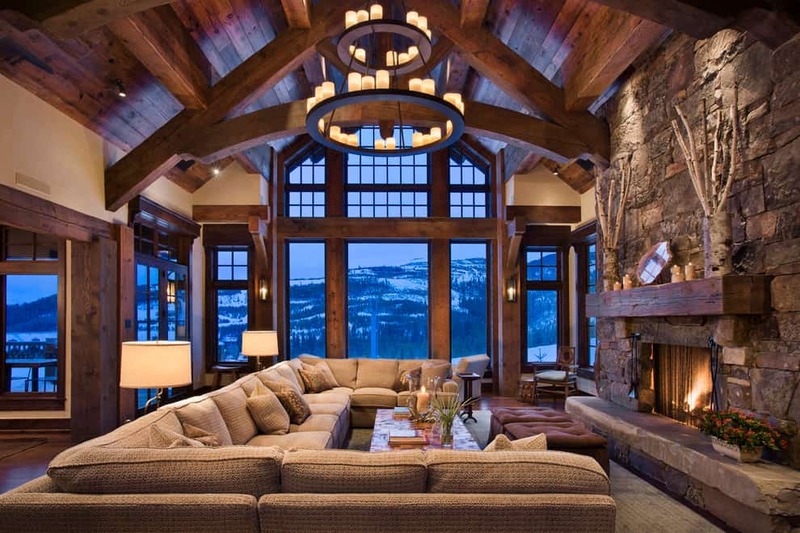 They let the natural light shine into this living room, highlighting the magnificent fireplace. Surrounded by windows that open up to let the fresh air in, this is the perfect spot to come sit and relax. You have an amazing view and an open sense that will please any time of year. 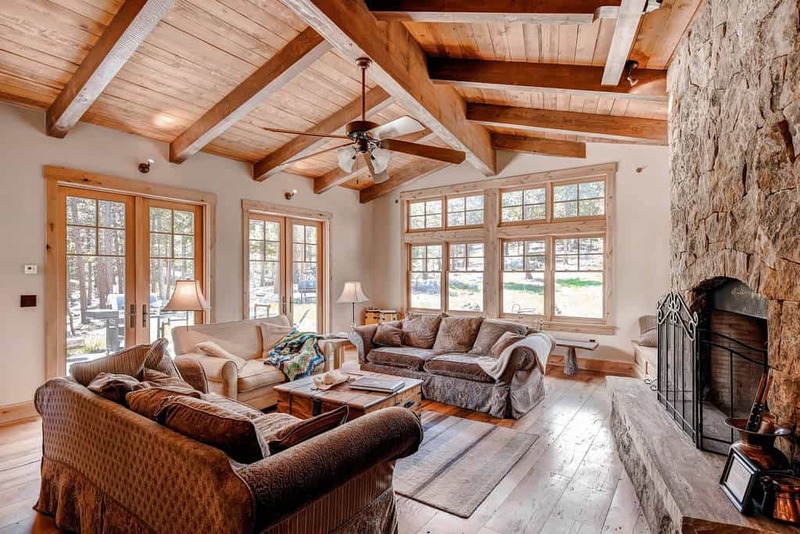 Whether you are coming to this living room to relax by a warm fire or to catch up on your favorite shows, you will find peace here. 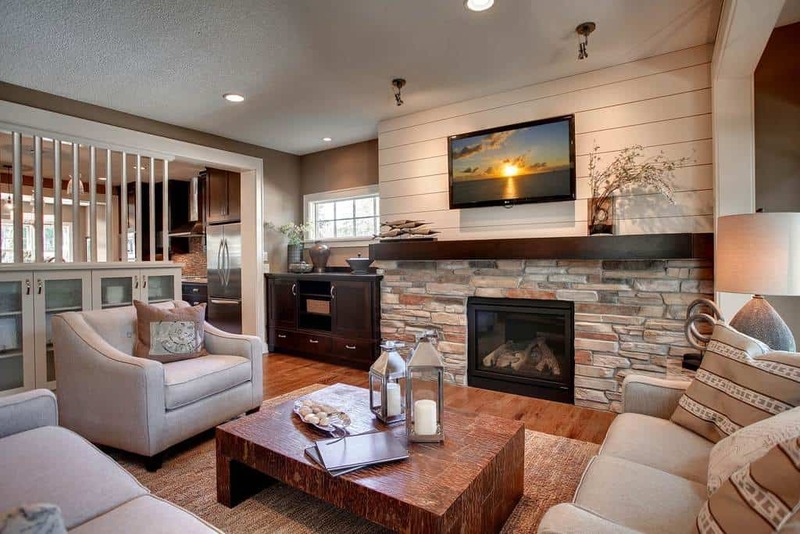 With a light style and a wonderful stone fireplace, your comfort is just beginning. With a high ceiling giving you an open space, this living room has classic hardwood furniture to go with the surrounding designs. The light shines in from outside to reveal a wonderfully styled room. 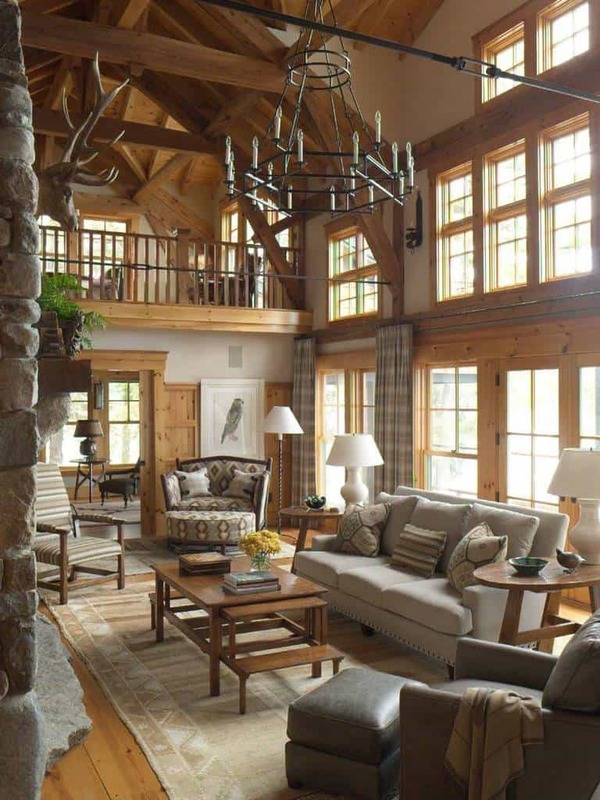 In this living room you see how well the contemporary furniture and decor goes with a classic rustic design. 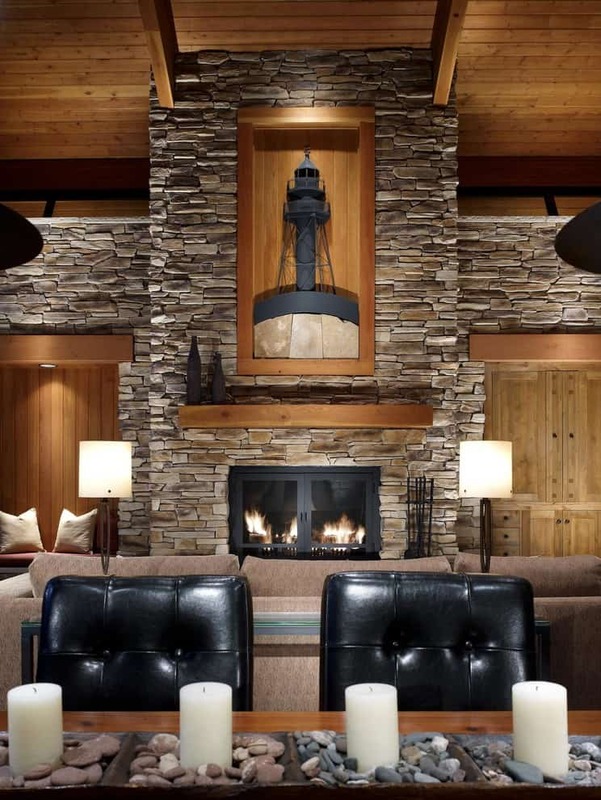 From the light fixture to the stone fireplace, this room has great character. When you need a room to come to relax in, this is the spot. With light styles that shine in the abundance of natural light, you and your guests can enjoy a warm fire. Design your spaces to suit your needs. This room is decorated to match the fun atmosphere. 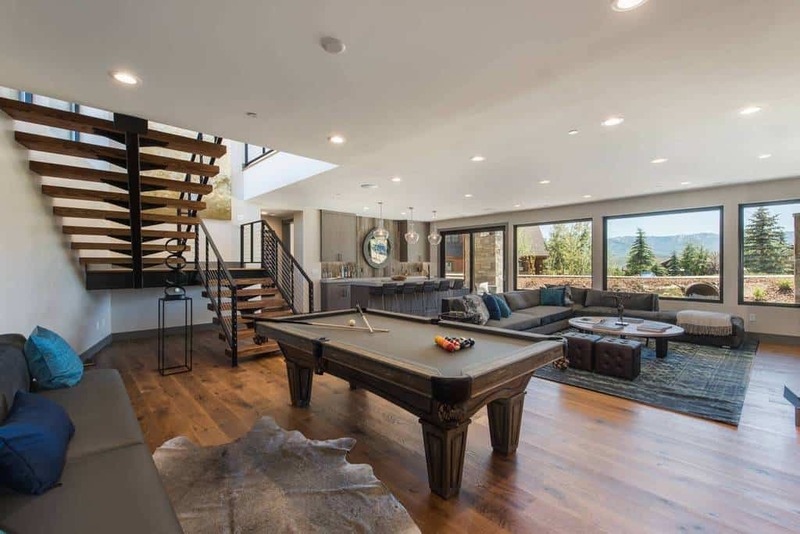 With plenty of game tables and games, this room blends the best hardwood styles to make a great space. 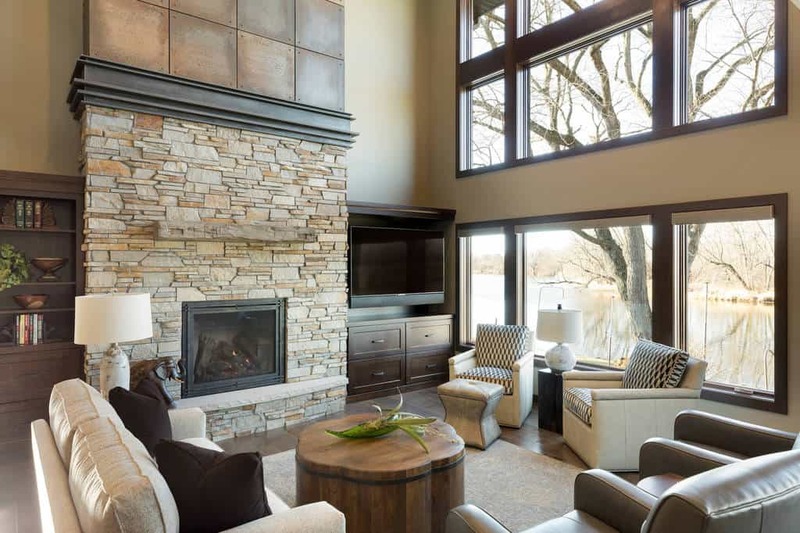 Featuring the perfect little fireplace, this room blends stacked stone and hardwood to a masterful style. The light shines in and gives this living room an open sense that you will enjoy. 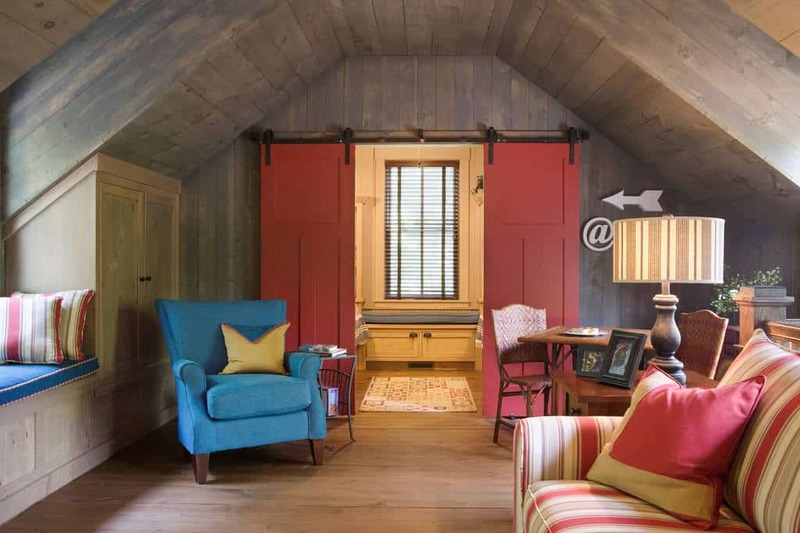 Like a traditional log cabin, this light space makes use of the best designs. 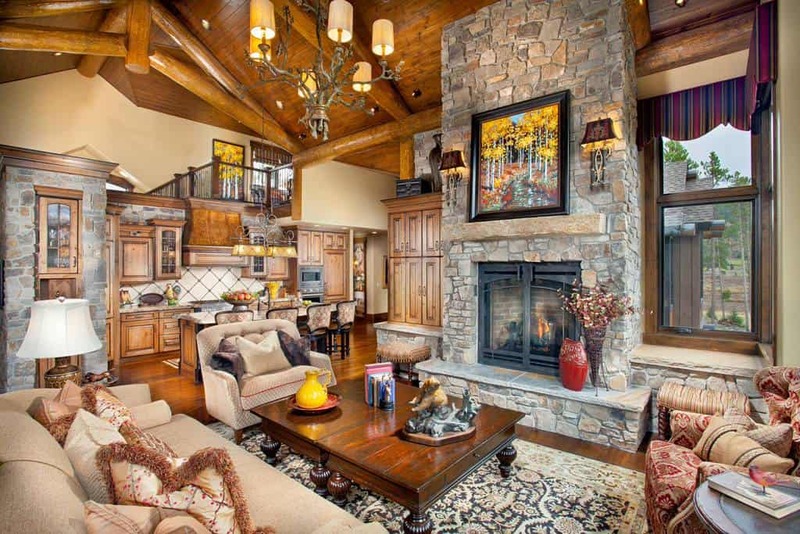 From the stone fireplace to the wonderful patterns on the furniture, this room is complete comfort. The creative shelving in this living room steals the show. With a dual purpose of style and functionality, the shelves show off your decor and hold your books. The light brick fireplace is a perfect way to center this room. 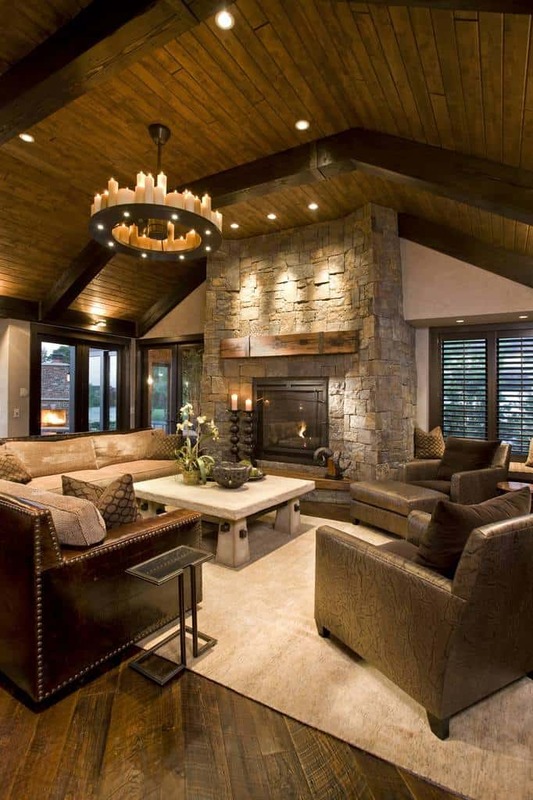 This living room relies on natural stone and hardwood to make it wonderful. The furniture doesn’t overwhelm the space, giving it an open sense that shine in the natural light. 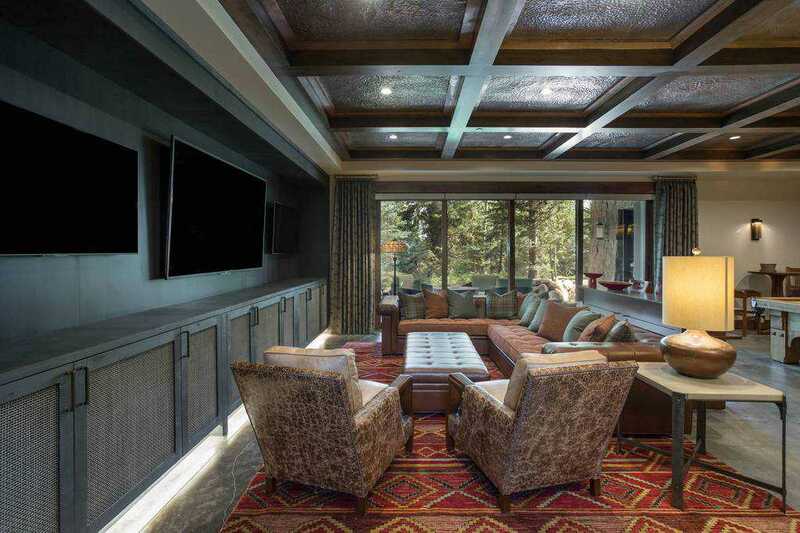 This contemporary space is made to give you a theater style atmosphere and it does it with style. With natural materials as a backdrop and beautiful dark furniture, this is a place you and your guests will love. 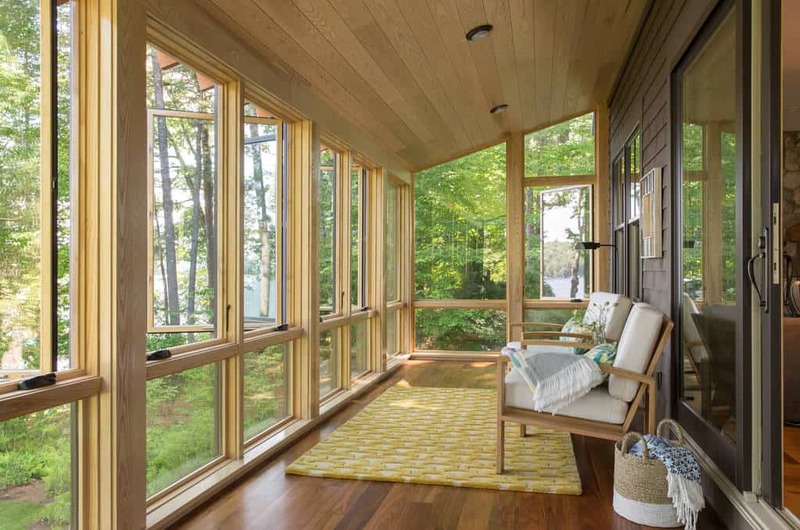 Take a slight tropical style and blend it with the light hardwood of a cabin and you get absolute beauty. This living room lets your relax in a space connected to the bedroom. The rough stacked stone used for the columns brings this space wonderful character. With entertainment in mind with the decor and a space for relaxing and sleeping, this is a multi-purpose area. 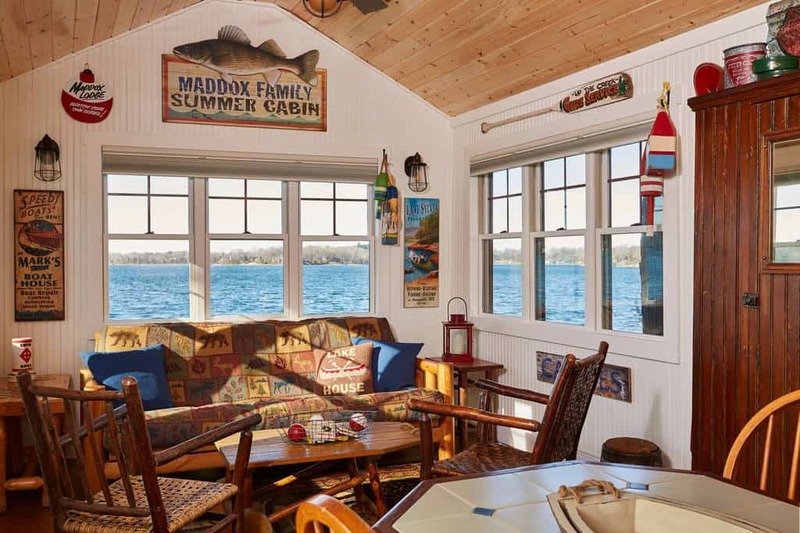 Spend every summer night relaxing in this beautiful cabin, with a light and fun style. The decor is lively and the white walls make a great contrast to the hardwood around the room. You can make your living room come to life with actual plant life. 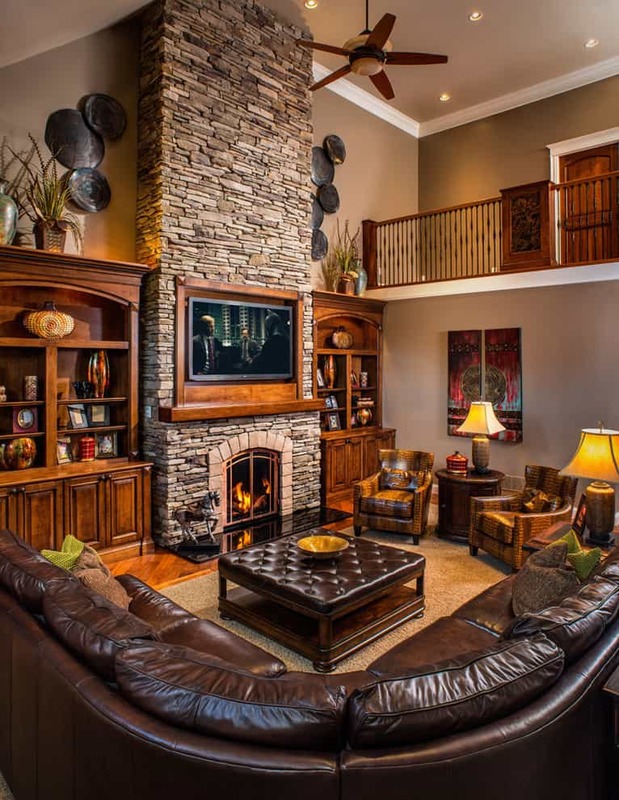 This living room has a beautiful stacked stone fireplace and brilliant matching decor. Sit back and enjoy the warmth. With a high ceiling that brings a certain elegance to the whole room. From the carpet to the crafted furniture, this living room uses a great color scheme to create a welcome space. 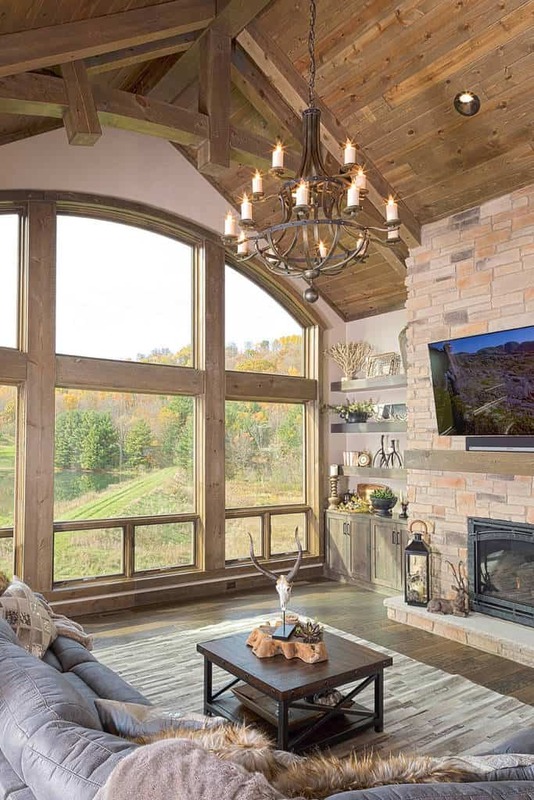 The television is mounted on wooden planks that bring character to this room, especially with the stacked stone columns on either side. The gas-lit fireplace will keep you warm all year around. With beautiful dark hardwood used for the floor and around the room, the darker furniture is a great match. 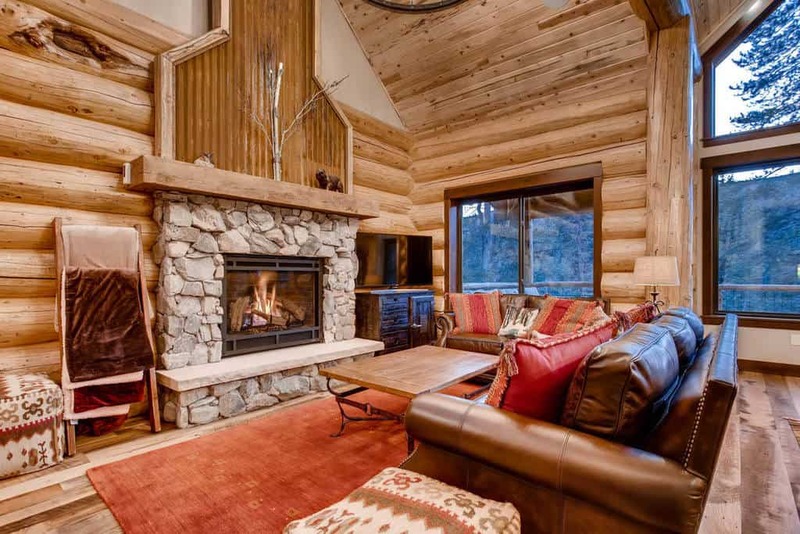 With brilliant decor that is just right for this space, you have a wonderful cabin getaway. No matter your personality, you can always find a way to reflect that in your living room. This one is filled with flags and pastel color furniture. With wonderful natural light from above, the whole room stands out. 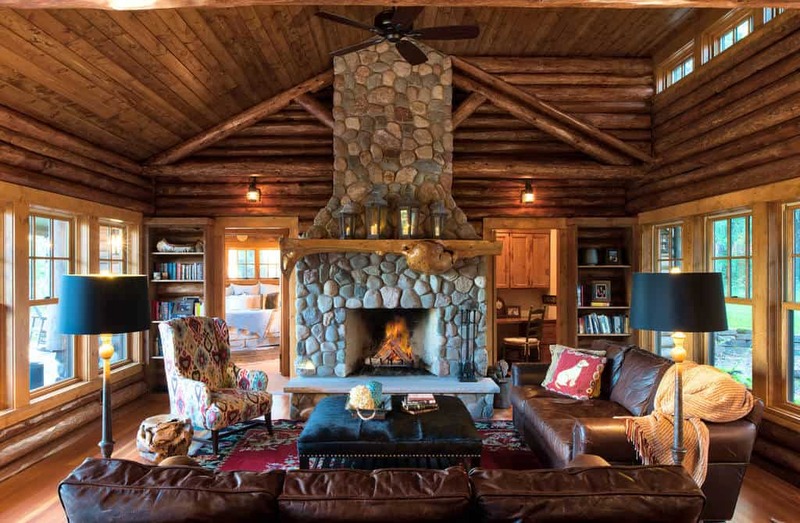 The round stacked stone design used for this fireplace bring the room great character, blending wonderfully with the traditional log cabin design. 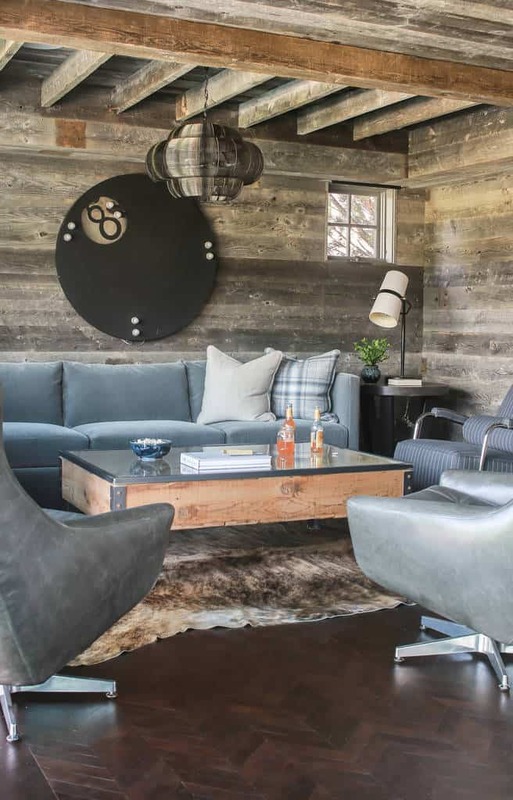 Blending an industrial style with a studio rustic feel, this living room is warm and functional. 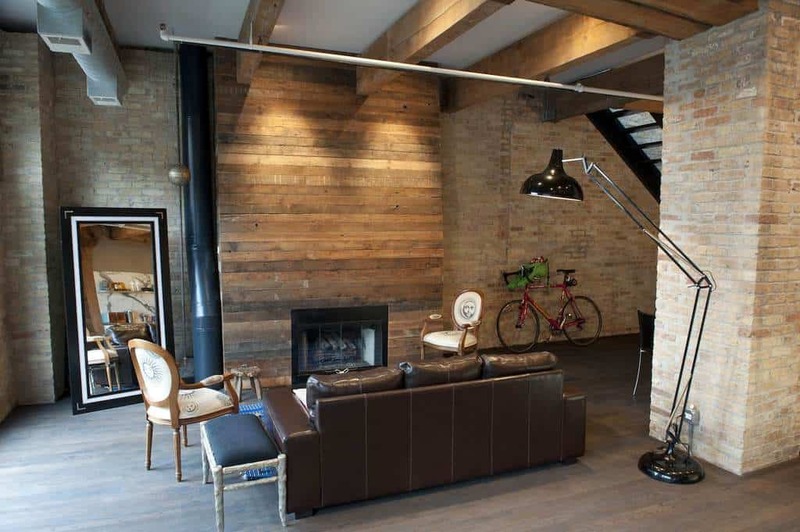 The brick works perfectly with the hardwood to create an open and fun space. The high ceiling in this space allows for large windows that arch upward and let in plenty of natural light. The decor is spot on, blending well with the mountain ambiance. The beauty of this room is the ability to look out at the landscape from all sides. The wonderful stone walls blends perfectly with the stone floor and hardwood around the room. 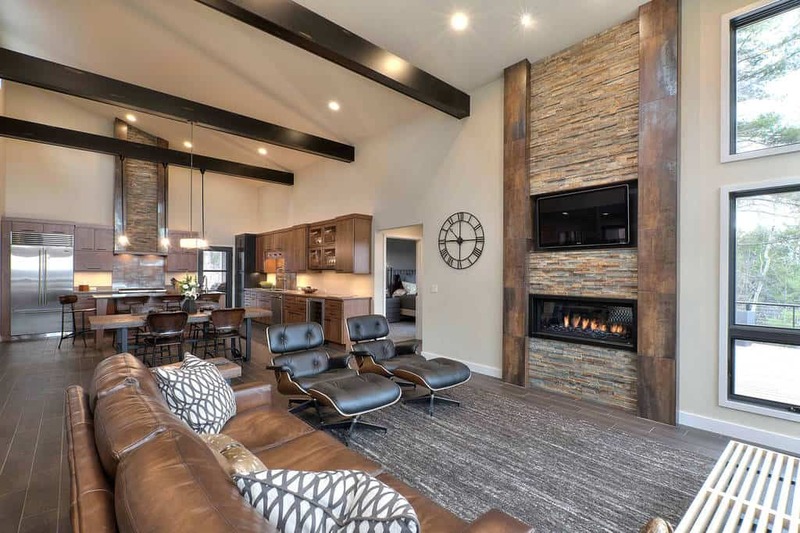 With bold dark hardwood used for the ceiling, beams, and walls, this room comes together with a grand stone fireplace that will bring the warmth. With a large wrap around couch, you and your guest can relax here. Taking a hardwood space and making part of it white is a great way to bring a room life. 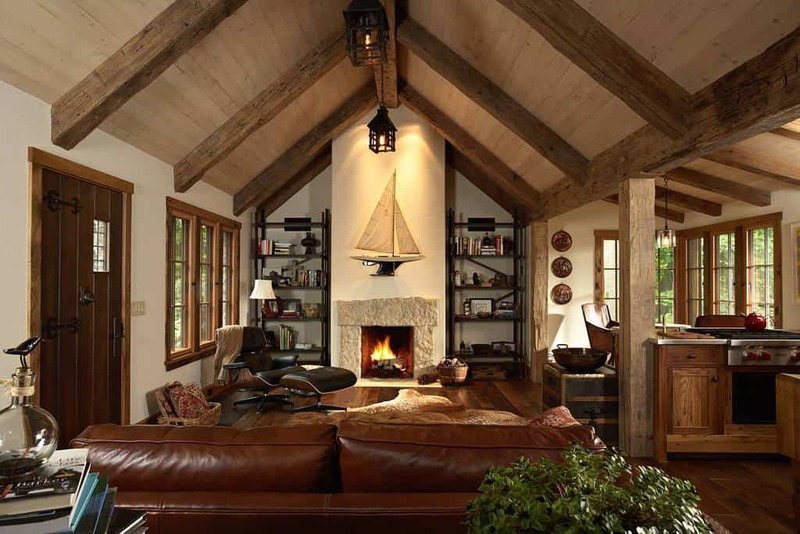 This turns into a beach style rustic living room, complete with light colored furniture and decor. When you look around this living room you take in all the patterns, from the rug to the pillows and furniture. Everything here works together to create a vibrant atmosphere. Your living room should be a space that suits your personality, and this room shows you just how to do that. 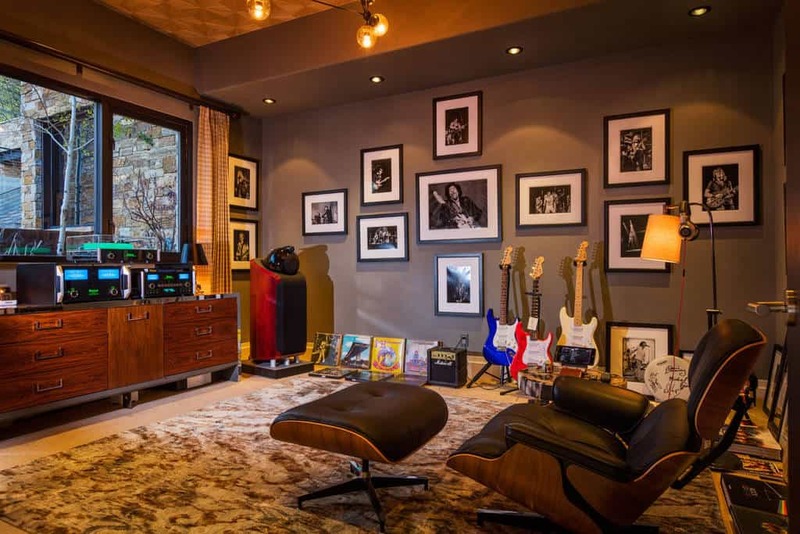 With musical decor and photos and laid back furniture, you can make a space just for you. 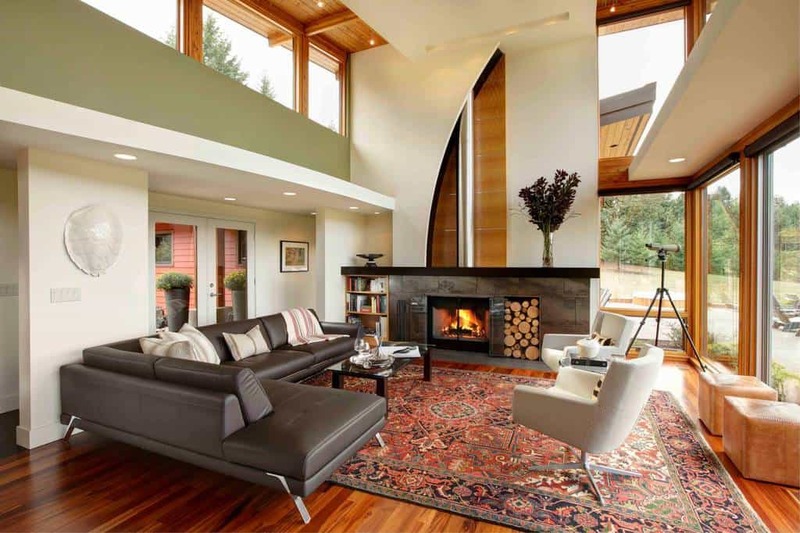 This is a contemporary living room, with beautiful furniture to match the sleek architecture of the space. All connected, from the kitchen and living room to the dining room, you can enjoy the natural light shining in. With a beautiful design at work for the ceiling, which matches the hardwood floor and darker wall, this room is a dream. Set up so you can sit back and keep everyone entertained, you will host many party nights. The lighthouse leads the way in this living room. 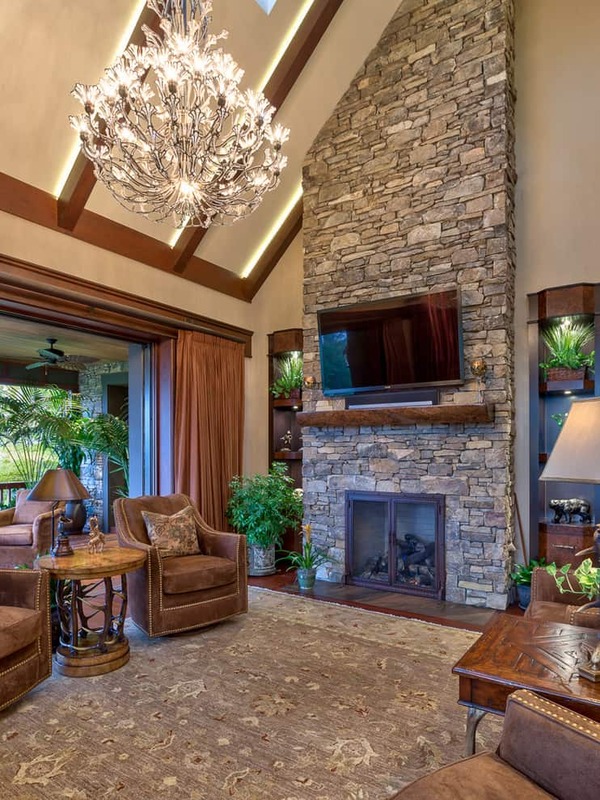 With a beautiful stacked stone design that wraps around the room, the decor matches. With a calm sense of style, this living room is a relaxation space. 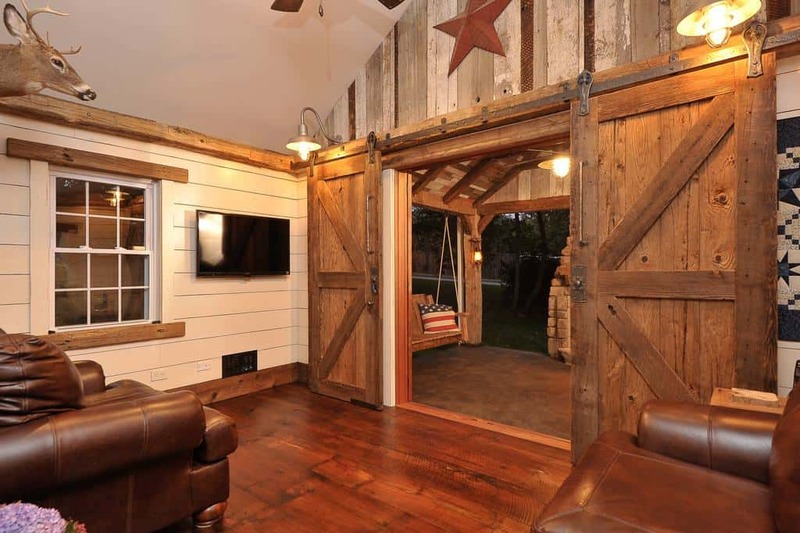 Slide these barn style doors open to open the living room up to the outdoors. What a great way to extend your party space. 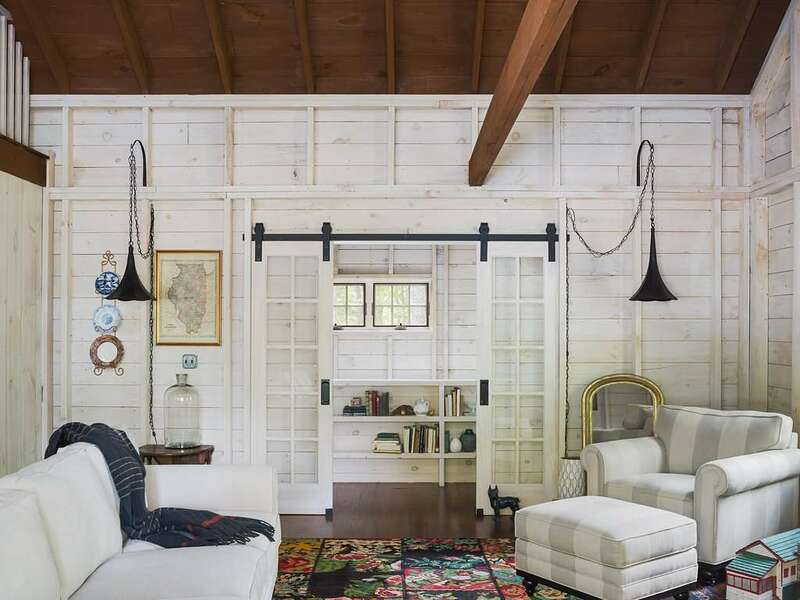 This whole room has a classic bucolic style that brings character. 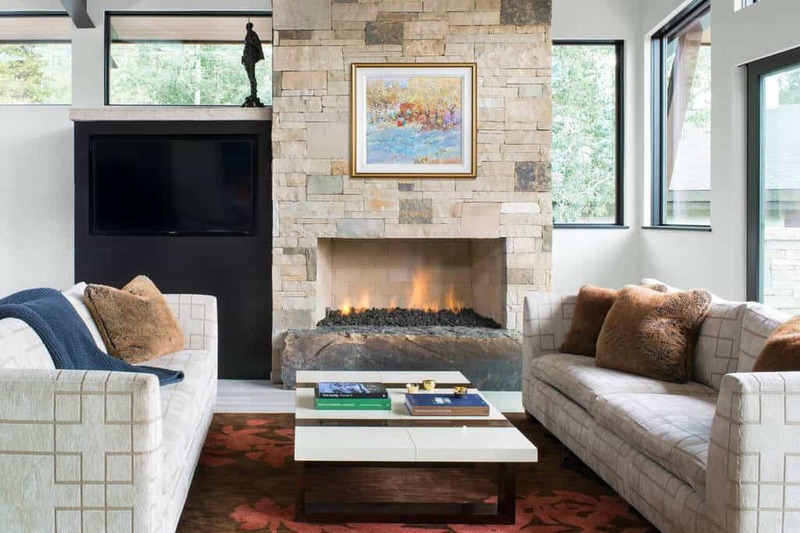 The a contemporary design at work in this living room, the natural materials used bring it to life. 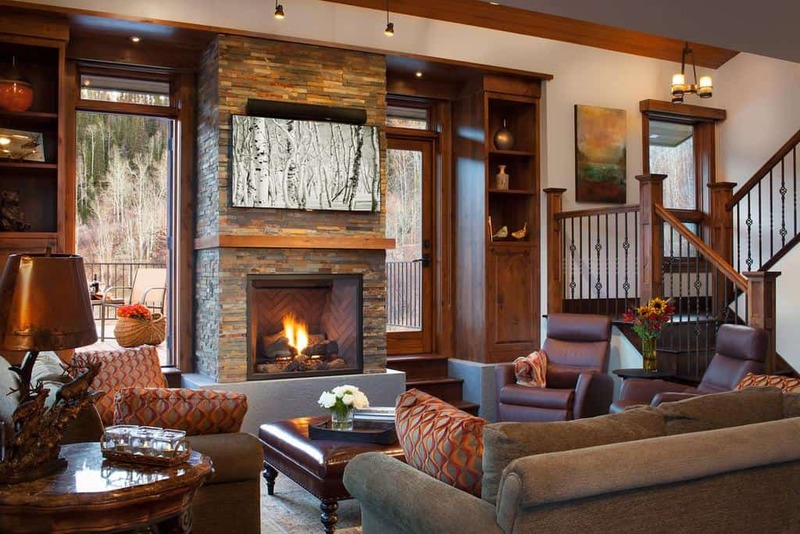 With a warm fireplace and beautiful hardwood designs, you will enjoy being here after a long day. 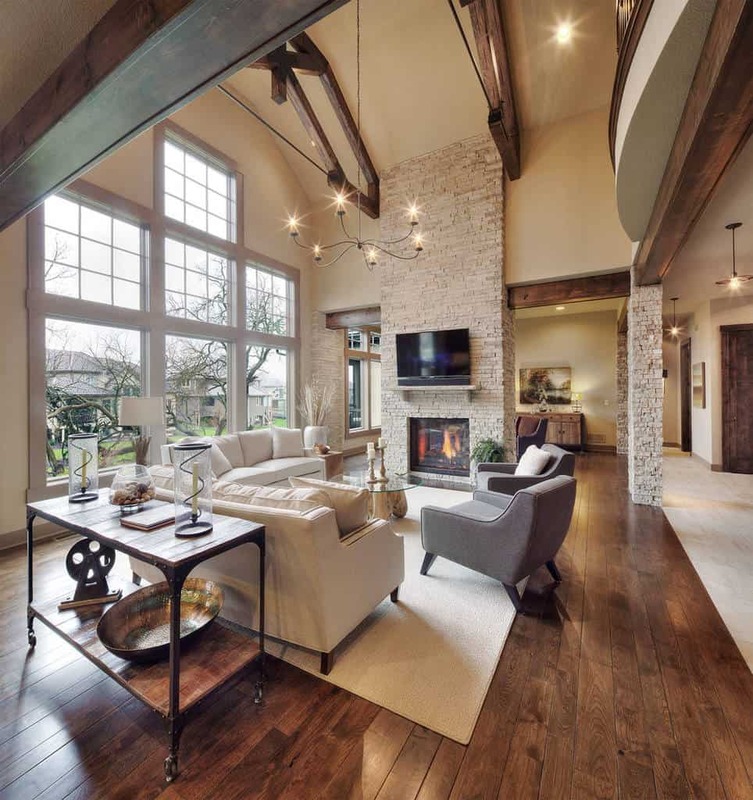 With a high ceiling that gives this living room an open sense of style, you can enjoy the stacked stone fireplace that rises up and give your a warm space. The furniture is classically styled, bringing character to this room. With no space wasted, this room takes a brilliant and colorful approach to design and decor. With multiple shades of hardwood blending together perfectly, this will always be your room to relax in. 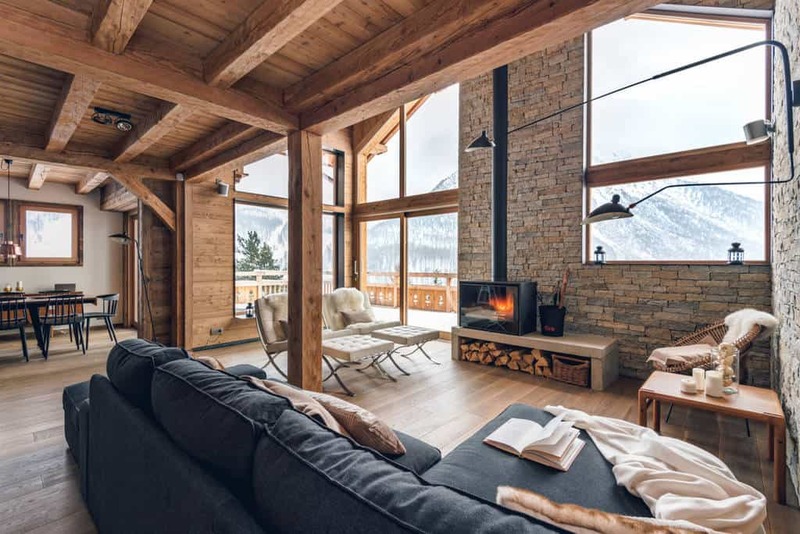 With a modern design style and natural materials to build with, this living room brings in great furniture that matches the surroundings of the room. Photo by Signature Homes of the Chippewa Valley LLC. 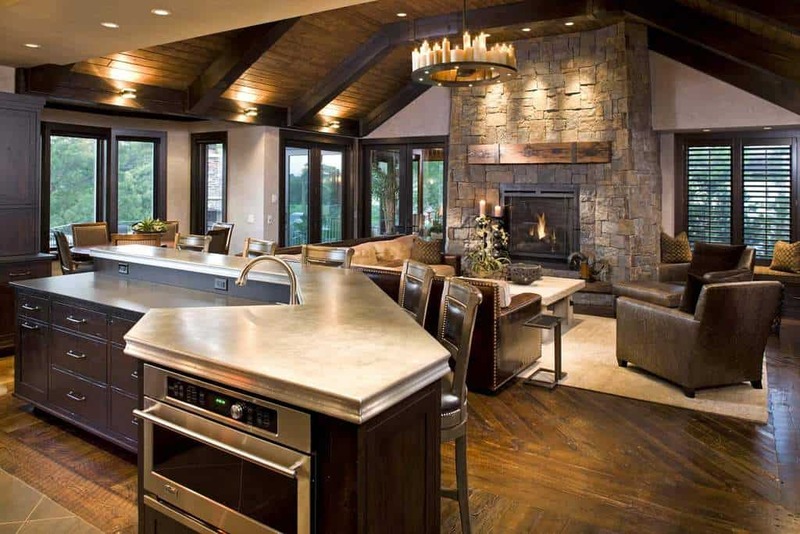 From the stacked stone fireplace to the beautiful table and cabinets, this room is made from natural materials that look wonderful. With plenty of natural light allowed in, this room is the perfect space to sit with a book. 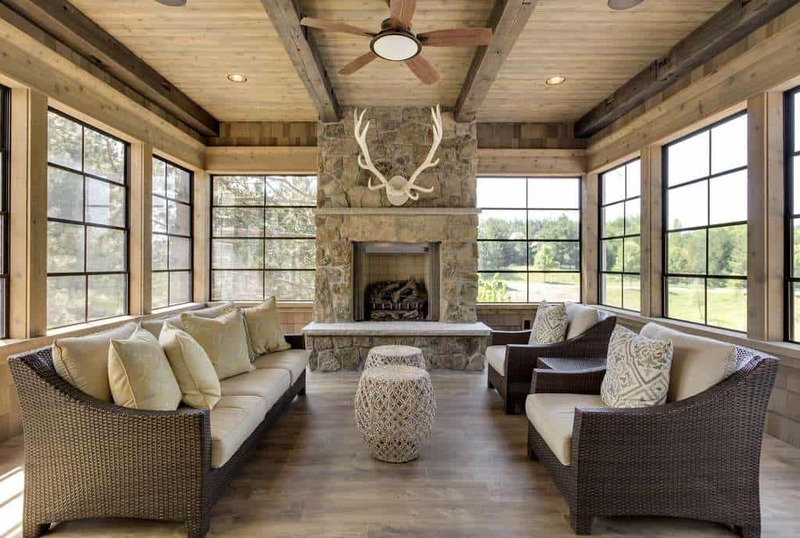 With a bucolic blend of weathered hardwood and a wonderful modern furniture style, this living room is the place to go wtih family and friends. The blues blend perfectly with the hardwood around the room.